Fig. 1.—Simplest Form of Glued or Rubbed Joint. 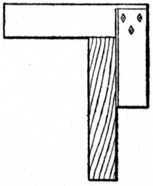 Supporting the Joint.—The jointed boards should not be reared up against a “bench leg” or wall without having any support in the centre, as dotted line at Fig. 5, because in all probability they will fracture before the glue has time to set; and, when we go to take them up to renew working operations, we shall be annoyed to find that they have assumed a position similar to that at Fig. 5 (shown exaggerated), and this will, of course, necessitate re-jointing. Fig. 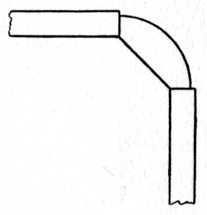 7.—(A) Glued Slip, (B) Glued Moulding. 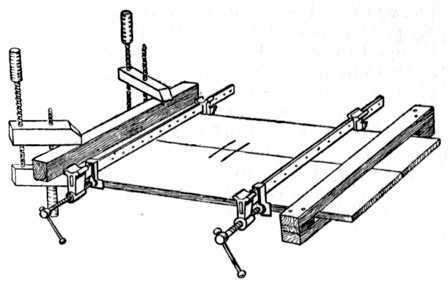 When jointing, care should be taken to first plane up the boards true on one side—i.e., take them out of winding. The method of testing for this is shown at Fig. 9, and it may with advantage be used when jointing the edges of the boards. Two laths or strips of wood are planed up to exactly the same width, having their edges straight and parallel. 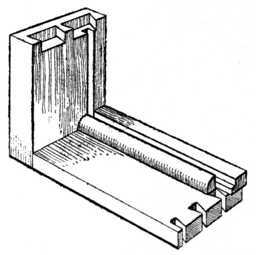 One edge of each lath may, if desired, be bevelled a little. 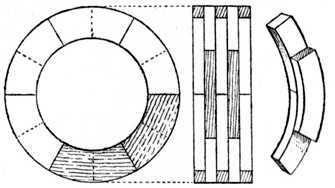 The method of using these “twist sticks” or “winding laths” is to put them on the board as indicated, and sight along their top edges. The winding laths, being much longer than the width of the board, show up the irregularity greatly pronounced. Fig. 9.—Testing Surface with Winding Laths. Fig. 10.—Showing Heart side of Timber one way. Fig. 11.—Heart side of Timber shown alternated. Fig. 12.—Grain of Quartered Timber. Fig. 13.—Boards showing uniformity of Grain. Judgment should also be exercised to avoid jointing in which one piece of timber is wild and large in the grain, and the adjoining piece of a mild-grained nature. Jointed boards should always be glued up with the grain running in the same direction if possible; this we show at Fig. 13, and nothing looks worse than a dressing chest end or similar piece of work in which the grain runs haphazard. 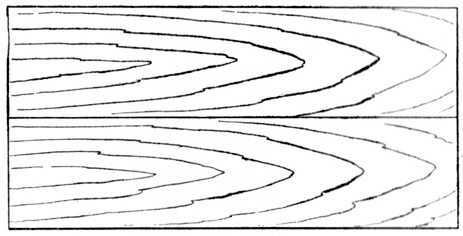 When jointing thin timber (say, 1⁄4-in., 3⁄8-in., 1⁄2-in. and 5⁄8-in. boards) the best method is to use a shooting board (Fig. 26). It must be noted, however, that a shooting board and plane practically never give a true right angle, owing to wear and the grinding of the blade. Therefore, the boards should not all be laid with the “face mark” on the shooting board whilst the edges are shot, because any inequality would be multiplied by the number of pieces jointed. A better method is to alternate the boards, face side up, then face side down, whilst shooting the edges; this will prevent convexity or concavity on the face of the jointed board, because any slight error in the angle is neutralised (see Fig. 8). Fig. 14.—Carcase Wing-pieces Glued on. Fig. 7B shows a moulding glued on a shelf, both mould and shelf in this instance being of polished hardwood. A shelf of this type might be used in a recess, the object of the overhanging moulding being to hide a small 3⁄8-in. 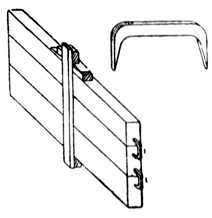 iron rod which would carry the curtain rings and heading of the curtain which covers the recess. The shelf would be fixed about 3 ft. 9 ins. to 4 ft. 3 ins. from the floor. Fig. 15.—Butting Mitred Angle Joint. Fig. 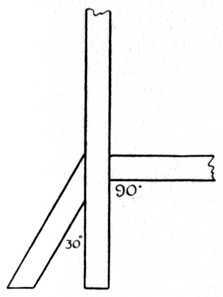 17.—Jointed Timber at 30° and 90° angles. Fig. 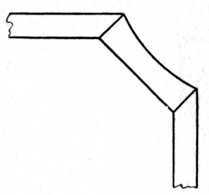 20.—Jointing a shaped Spandrel. Fig. 21.—Building up Case of Piano Front. Fig. 22.—Use of the Try-square for Testing Edge. Fig. 23.—Example of Circular Laminated work. Fig. 24.—Glueing Ploughslips to Drawer. Fig. 25.—Method of holding Glued Joints with Iron Dogs. Fig. 26.—Method of using Shooting Board. Fig. 27.—Cramping Glued Joints: Handscrews and Batten shown at left; temporary Batten at right to keep the wood flat. The method of using iron dogs is illustrated in Fig. 25, and it will be observed that owing to the wedge-like formation of each fang (see enlarged sketch) the dog exerts the necessary pressure to close the joint. At the centre of this illustration is suggested the home-made hardwood blocks, baseboard and wedges referred to on previously.